Busy traveling today, but here’s a few Music Maven favorites to keep you company. Ok, despite the YouTube promotion debacle, we’re going to try this again. Now, admittedly, I’m not a huge Stones fan as I have thought that they were overrated and over-tauted over the years. I really felt that they rode the coattails of The Beatles and that they never were of the same caliber. 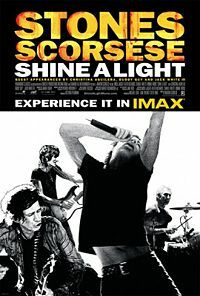 However….I have to say that after watching the trailers and some of the videos from Shine A Light, I have a new respect for The Rolling Stones. Consider this…these guys are nearly qualified for Social Security, I mean, if they were American citizens. At 64, Mick Jagger and Keith Richards are simply unbelievable. I have evidenced first hand that many in the Boomer generation are “not your father’s Oldsmobile”, but The Stones are phenomenal. 64, people. That is nearly 20 years my senior. And, oh so clevah….notice on this YouTube vid who the author is. They don’t restrict embedding. No…they want us to post away. SSSSmmmmarrrttttt. Richards is an institution in himself. Even though Lefsetz thinks Keith is a sell-out, I don’t think there’s any such thing. Make some money, Keith. We know where your heart is. This CNN Money article by Paul LaMonica addresses the recent class-action lawsuit against YouTube by members of the National Music Publishers Association. This joins Viacom’s billion dollar copyright infringement lawsuit against Google and YouTube. Now I understand artists and songwriters concern over copyright infringement, but I think they are stuck in the old model. While many experts believe that “big media” clips on YouTube only account for a fraction of the actual videos, the fact that they host and provide vids of musical artists and sporting events causes those owners to claim foul. My question is are they shooting themselves in the foot by trying to curb people’s enthusiasm? As with music files, is it more important to protect the artists involved by restricting ALL usage for pay that provides minimal exposure and/or return to the artist? Or, is it more beneficial to the artists to have people exposed to the music so that they actually spend more money on the music through concerts, merchandise and maybe even some music to support artists that they enjoy? I know these are rhetorical questions, but I’d like others’ opinions on this issue. This isn’t going away and for some bloggers (like yours truly), it would take away the main purpose of the blog — to share music with others. So, give it to me straight….are we jeopardizing artists’ livelihoods by not paying to use their material or do we actually enhance revenue opportunities for artists by writing about them and exposing performances to others? ETA: Here’s an MSNBC article on super-duper technology that will at the very least, limit, some of the vids….digital fingerprint? I’m really tech ignorant when it comes to this, so…..How do it know? I mean, if someone tapes an HBO special on DVR, then uploads it to YouTube, will the digital fingerprint be passed from broadcast to DVR to YouTube, then gotcha? I can sort of see TV shows but this really doesn’t address alot of music vids, right? Damn, my head hurts…. ETA2: Bob Lefsetz’s take from a couple of months back.